Our dream to build an eco-friendly hostel in Otres Village was born at the tail end of 2015. Our inspiration comes from a magical faraway place where Peter Pan and his Lost Boys live. 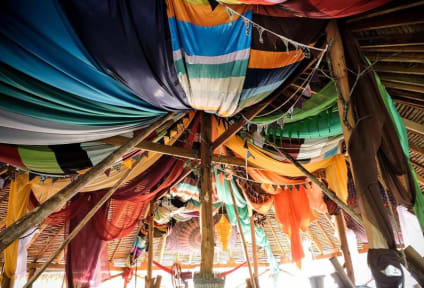 With the help from volunteers, travel pals, and friendly local Khmer people, we built an unique hostel with open construction made out of natural materials and recycled woods. Currently we have five tepees and a two story treehouse style dorm for our guests, being able to accommodate up to 25 guests. It has been decorated like no other place you will find in Cambodia. // Our outdoor kitchen is fully stocked and ready for us to cook delicious meals together! We are working on planting a small garden full of fruits and vegetables for all guests to use! Currently we are growing bananas, mangos, passion fruits, dragon fruits, pineapples, morning glory, chillies and much more in between our jungle style accommodation. With your help we would love to plant even more! We opened the gates in November, by January this year the hostel was in full swing. From this came good and bad experiences and expectations which we would like to carry into the start of this new season. One of our proudest set ups is the weekly village clean up (Mondays) where we collect the trash left behind from tourists and locals. We like to respect our environment and we would like you to get involved - you get a good mix of people from around the village helping out creating a team like atmosphere. We also like to hold food nights - last season we held at least 3 nights a week in which we invite travellers and friends to try different world cuisines including Khmer, Indian, Mediterranean, Mexican, German, Austrian and Italian dishes. Our opening hours are from 8am to 12pm every night, in order to ensure guests and volunteers are well rested - last orders are usually around 11.30pm and the bar is closed by 12am. Come to our place and you'll be lost in a world like no other. We are located in the humble but buzzing Otres Village. Good hostel, friendly staff. I would recommand it. 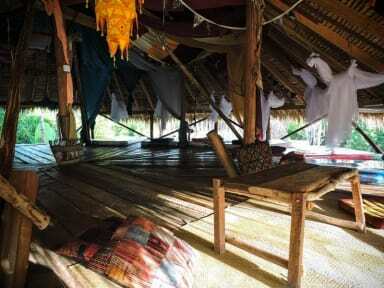 The place looks really cool: everything made out of wood, hammocks, cozy lights in the evening.. I just felt like I wasn't really the type to fit in here, as the place invites to a very specific crowd (hippie kind). Also it wasn't possible for me to get a good sleep since it was noisy at night and too hot during the day. There are no showers, only buckets and I couldn't find a mirror. Staff is very friendly though. I'd say it's nice to go here for a drink, but wouldn't recommend staying here.